- Gildan Ladies' 4.5 Ounce Softstyle® T-Shirt. - As in 64000, but side seamed with fitted silhouette, fashionable 1/2" collarette. 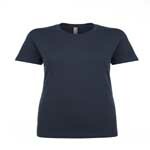 Gildan Ladies' 4.5 Ounce Softstyle® T-Shirt. As in 64000, but side seamed with fitted silhouette, fashionable 1/2" collarette. Heathers contain 35% cotton/65% polyester. Antique colors and RS Sport Grey are 90/10 cotton/polyester. Sizes S-3XL: Neutral: White. Heather: RS Sport Grey (90/10). Colors: Antique Cherry Red, Antique Heliconia, Antique Sapphire, Black, Dark Heather, Heather Orange, Heather Purple, Light Blue, Navy, Purple, Red, Royal. Sizes S-2XL: Colors: Azalea, Berry, Charcoal, Cherry Red, Cornsilk, Dark Chocolate, Heather Royal, Irish Green, Kiwi, Sapphire.